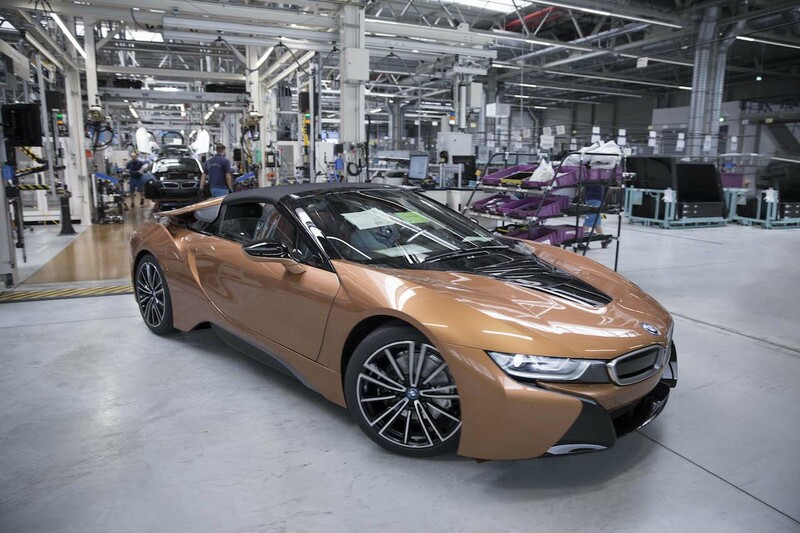 BMW has the started series production of the BMW i8 Roadster in Leipzig, Germany. The new open-top model is joined by the updated version of the BMW i8 Coupe in the line-up. 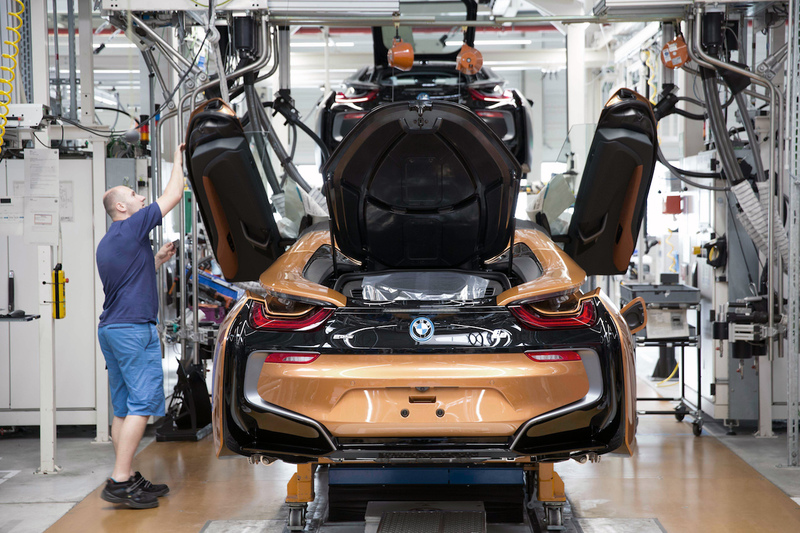 The BMW i8 Roadster is built on the same production line as the new BMW i8 Coupe at the BMW Group Leipzig Plant. The BMW i8 Roadster is built on the same production line as the new Coupe. The Roadster version has an electrically operated soft-top that opens that opens and closes in 15 seconds at up to a speed of 50 km/h. The soft-top stows away in a space-saving perpendicular position. This creates around 100 litres of additional storage space behind the seats. Other exterior highlights include BMW Laserlight with BMW Selective Beam (optional), Air Shutter on the hood, frameless gullwing doors, exclusive 20-inch wheels (optional) and “Roadster” badging on the C-pillars and on the rear. Capro interior trim, comprising full-leather upholstery in Ivory White/Black, is standard in the BMW i8 Roadster. Buyers can opt for Halo interior trim and the new Accaro interior trim with an Amido/E-Copper colour scheme. Navigation System Professional infotainment system, BMW Display Key, Driving Assistant including Surround View and a mode 2 charging cable are standard. More features, such as BMW Head-Up Display and acoustic pedestrian warning, are available optionally. The BMW i8 Roadster uses the 374 PS BMW eDrive plug-in hybrid drive system consisting of a 1.5-litre BMW TwinPower Turbo turbocharged three-cylinder petrol engine and a BMW eDrive electric motor. The combustion engine produces 231 PS and 320 Nm of torque and sends power to the rear wheels via a 6-speed automatic transmission. The electric motor generates 143 PS and 250 Nm of torque and sends power to the front wheels via a 2-speed automatic transmission. An 11.6 kWh Lithium-Ion battery powers the, enough for a zero-emissions driving range of 53 km. Using the latest BMW i Wallbox, the Lithium-Ion battery takes 3 hours to get fully charged at a rate of 3.6 kW. The BMW i8 Roadster weighs approximately 60 kg more than the BMW i8 Coupe. It takes 4.6 seconds for a 0-100 km/h sprint, and has an electrically governed top speed of 250 km/h. The BMW i8 Roadster will hit the first markets in May this year. The BMW i8 Roadster will hit the first markets in May this year. Its Indian launch is also scheduled to take place this year.